Senator Elizabeth Warren has a plan to ease this crisis—and Obama just backed it. President Obama announced a new strategy Monday to combat student loan debt: a dual plan to lower the payments students must make while also giving them an opportunity to lower the principal on those loans. Obama announced he would take executive action to expand a law enacted in 2010 that allowed recent graduates to pay no more than 10 percent of their monthly income to student loan repayments. That law was limited to people who got loans after October 2007 or who stopped borrowing by October 2011, and the executive action Obama promised Monday would extend it to approximately 5 million people who had older loans. It will not go into effect until December 2015, however, while the Department of Education implements the new requirements. Obama also announced he would act to renegotiate federal contracts with a wide variety of companies that service federal student loans in order to give students in danger of default more options to avoid it. 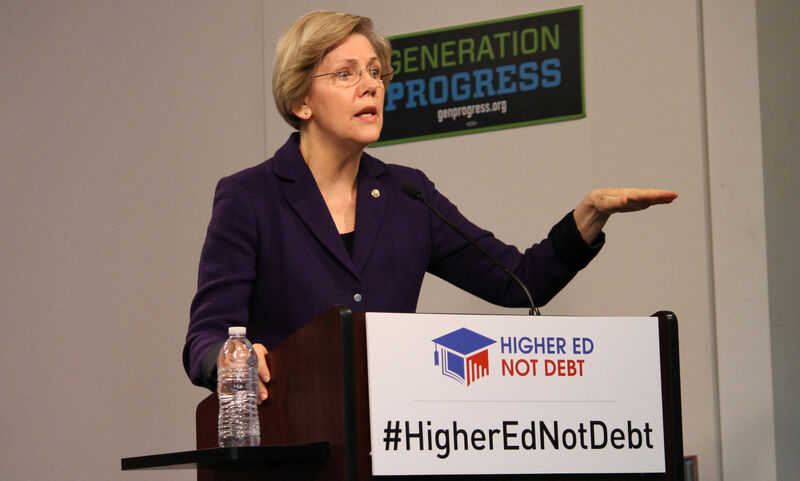 Beyond those relatively small-bore ideas, however, Obama also backed a plan from Senator Elizabeth Warren and other Senate Democrats that would allow people with outstanding student loans to refinance them at the lower rates offered to recent graduates. In 2013, Congress set the interest rate for new student loans at 3.86 percent. But millions of Americans have loans with higher interest rates, often in the high single digits, and that bill would allow them to refinance the loan. Mass refinancing of federal student loans would naturally cost the government money, but the bill proposes that it be paid for by enacting the Buffet Rule, which closes tax loopholes for very wealthy Americans and ensures that they pay at least a 30 percent effective tax rate. The chance that congressional Republicans would allow this bill to pass is essentially zero, but Obama’s endorsement gives not only a crucial boost to the idea of student loan refinancing, but also Warren’s burgeoning role as a student debt reformer. It’s an issue likely to only get larger in American politics over the coming months and years. Cumulative student loan debt has reached an astonishing $1.2 trillion, and shot up 20 percent just from the end of 2011 to May 2013, faster than even the growth of revolving credit products like credit cards. On average, the student loan debt held by 25-year-olds has gone up 91 percent in the past decade. The problem has been exacerbated by tough economic times—nearly one-third of borrowers who have begun repayment are seriously delinquent.